Dealers in Britain saw a second straight month of rising new-car sales in August. LONDON (Reuters) -- Britain's Business Secretary Peter Mandelson said there were no plans to extend the car scrapping scheme that was introduced to help the auto industry through the recession. "At the moment we have no plans for extending or renewing it," he told BBC radio. His comments were made amid calls from the U.K. employers' group, the CBI, and other business groups that the scheme should continue or be phased out gradually. 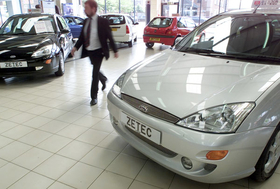 The car scrappage scheme, which encourages drivers to trade in old cars for new, more fuel-efficient models, has been credited with boosting car sales in the economic downturn. New-car sales in Britain rose an annual 6 percent in August, their second consecutive rise, the Society of Motor Manufacturers and Traders said last week. The government introduced a scrappage scheme earlier this year, which gives drivers 2,000 pounds ($3,312) to trade in cars more than 10 years old for a new model. The government earmarked 300 million pounds ($495 million) for the scheme and said it would end by early next year or when the money ran out. More than half of the funding has already been spent.